If we were to create a city today- what would the financial system for cultural productions look like? 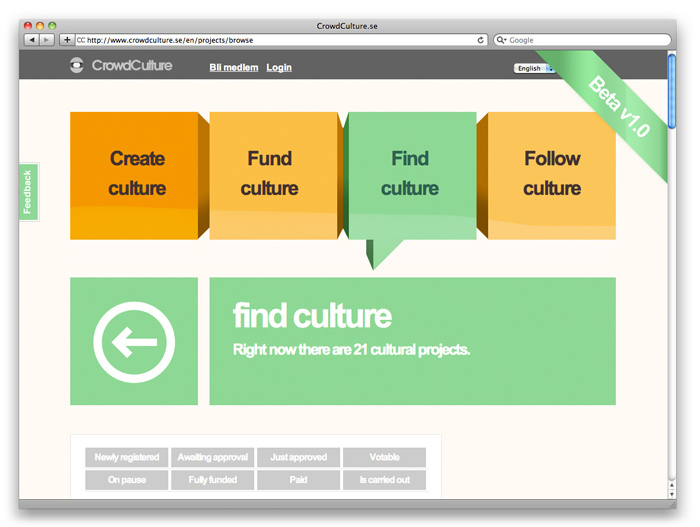 In Sweden, they have asked the question and come up with the crowdsourcing model Crowdculture. Crowdculture is an online platform that allows people to create, select and fund cultural activities in Stockholm. To participate, people have to sign up and 'invest' 50 SEK (6 €) per month. Each individual investment is then leveraged by public funds. 21 projects have been submitted so far and 8 of them are now fully financed. Crowdculture is designed to support relatively small activities. Initiatives include a documentary about lesbian lifestyle, a workshop created by young female palestinian refugees and a dance performance. This entry was mistakenly dated July 7. The correct date is June 7.